The Flir One detects thermal heat and energy. Every tech tradeshow usually has a whole bunch of smartphone and tablet cases on display, and the 2014 edition of Macworld/iWorld is certainly no exception. But an iPhone case that’s also a thermal imaging sensor? I can safely say that’s a first. The Flir One is an accessory that fits around your iPhone 5 or 5s just like a case, but packs its own camera on the back—right where the much loved Apple logo is located. The camera is actually a two-in-one—a visible camera and a thermal camera—so when the Flir One is in use, it temporarily turns off your iPhone’s built-in camera. It connects to your iPhone’s Lightning connector port and has an on/off switch for controlling when you’d like to activate the thermal sensor. 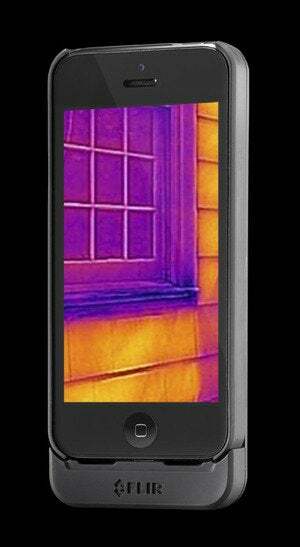 When you use the Flir One with its free companion app, you can spot infrared energy and heat sources. The app has several different filters, which can be used to see different thermal or moisture patterns. Filters include an arctic effect, rainbow patterns, black and white, and more. 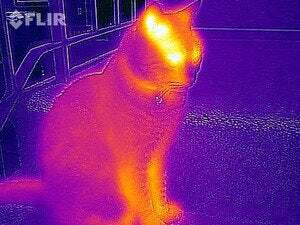 From my hands-on time with the Flir, this tool seems to work just as promised. I located some missing insulation in a model house, spotted some nasty wet spots on the carpet of the Moscone Center, and pointed it at random passerby to check out their color patterns. (Sorry, strangers). It’s intuitive enough that anyone can use it, yet seems to be powerful enough for the pros, too. The Flir One is scheduled to ship this May for $349, but you can sign up today to reserve one when they become available.